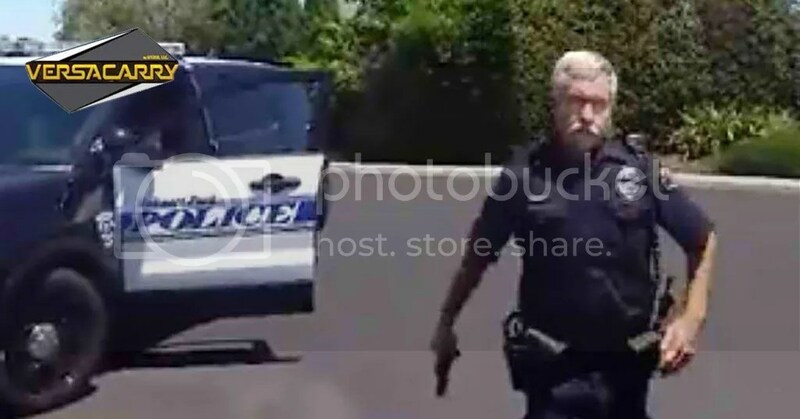 A video taken by a Rohnert Park resident captured his encounter with a police officer who drew his gun after the man refused to take his hand out of his pocket. How extensive does a perceived threat need to be before a police officer is permitted by policy and practice to draw a weapon in the line of duty? How quickly should a civilian comply with an officer’s directives — including a request to remove a hand from a pocket — even though the individual has done nothing wrong? These are some of the questions raised by a video that went viral last week of a Rohnert Park police officer pulling his weapon during a verbal confrontation with a homeowner outside his cul-de-sac home. It’s the latest in a string of videos and police confrontations that have fueled a national debate about use of excessive force by police officers. But how much this video contributes to that discussion is still up for debate. By all indications, the decision by the Rohnert Park officer to draw his service handgun and hold it unholstered during this encounter was a poor one. Given the circumstances, it was unwarranted and inexcusable. The only redeeming aspect is that the officer had the good sense to keep the weapon pointed down and prevented the confrontation from escalating by, after about three minutes, getting in his car and driving away. At the same time, there’s much that’s still unclear about this incident including what motivated the police officer, identified as Dave Rodriguez, to cruise down that residential street in the first place? Had there been a string of burglaries in the area? Was there something about the conduct of the resident, Don McComas, that raised suspicions? While the officer certainly could have handled the situation more professionally, McComas, by the tone of his voice and general combativeness, could have done more to defuse the situation as well. Unfortunately, since then, this situation has unfolded as one might expect. The city of Rohnert Park has announced that the officer has been put on paid administrative leave while the incident is investigated. The video has gone viral, and McComas has hired two local attorneys who say they plan to file a claim against the city that his civil rights were violated. “Families should not have to live in fear that they will be hurt by law enforcement,” said attorney Jarin Beck. There’s no disputing that. But color us skeptical about the attorneys’ claims that this episode is similar to that of Andy Lopez, who was shot by a sheriff’s deputy in the fall of 2013 and that the only difference is that McComas had a camera.